This one’s for the bloggers and marketers who would love sending their list an email notification once their blog article goes live! Email Subscribers is one of the best Bulk Notification Email Services on WordPress. It helps you to send an email notification to notify your customers about your blog article each time you post a new one. Icegram’s Rainmaker thought it would be really useful to integrate with this interesting plugin. Icegram’s Rainmaker has integrated with Email Subscribers! It’s a very simple setting but a thoroughly useful one. Configure the Form Action. Select Email Subscribers from the drop down. Insert the form shortcode anywhere on your website. Done! 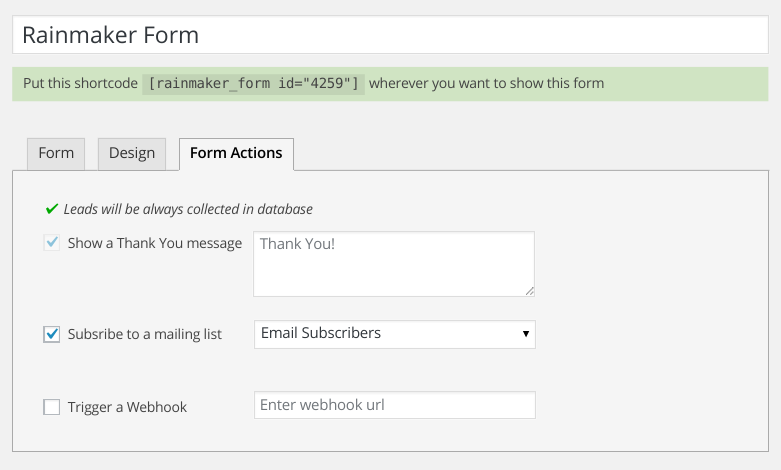 All the people that subscribe to this Rainmaker form will be saved in Email Subscribers database. You can then send this list automated emails as and when you post a new blog. Feel free to reach out to us in the comment section below or simply drop us a message. We will get back asap! Haven’t Downloaded Rainmaker yet? Download it for FREE now! I am taking a leap here. Jumped off of the Mailchimp train AND SumoMe to try Icegram. It looks like I will save about $60 a month. I can use that money for more gadgets for my biz. Let’s see how it goes…. Do try it out and incase you have any questions feel free to contact our support. We will assist you asap. I have in the past received many leads from a campaign that I have had going for a period. Unfortunately I do not have an autoresponder for some unbelievable reason. Any way. My question is whether I can eksport my collected leads from a genuin mail account to your Email Subscribers account. If so, can you give me a step by step advise on how I can do it? Email Subscribers does not provide auto-responders yet (except welcome email, and automatic blog post notifications). The feature is on our roadmap though. But it does allow importing subscribers using a CSV file. So if you can get your subscribers from Gmail (or anywhere else) as CSV, you can bring them on easily. i have integrated rainmake to a client’s worpress, but how can i personalise the confirmation email? You can find that option in Email Subscribers > Setting menu. Goto Signup confirmation tab and customize confirmation email content. When I click submit a message pops up immediately saying: you’ve been subscribed but it doesn’t seem like any data was actually collected. Thank you for wiritng in. Can you please write us at hello@icegram.com? Please attached the screenshot of campaign edit screen so thet we can check the settings.